Ädelbrook is pleased to announce the selection of Alyssa Goduti as its new President and CEO. Alyssa brings nearly 20 years of leadership, advocacy, and business development experience in Connecticut’s nonprofit human service sector. Most recently she served as the President and CEO of the CT Council of Family Service Agencies, a statewide association of human service providers which collectively serves over 180,000 people, employs 5,000 staff with total funding of over $250M. 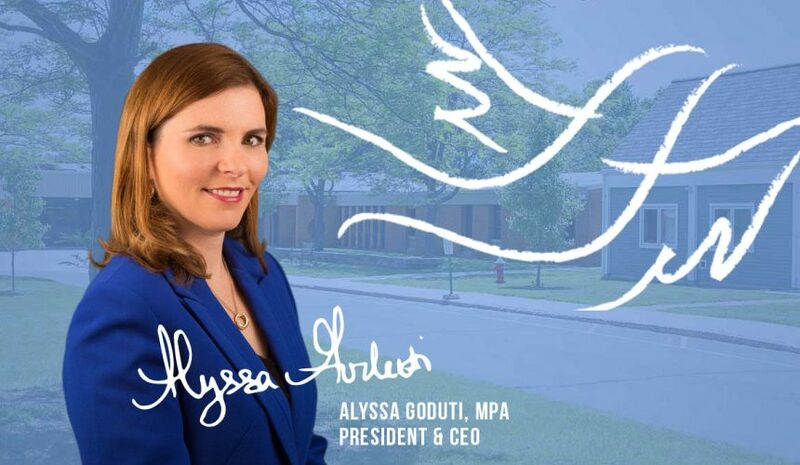 Previously, Alyssa served as the Vice President for Business Development and Communications at CHR and as the Vice President for Public Policy of the Connecticut Community Providers Association (now the CT Nonprofit Alliance). She is a true leader and innovator within the nonprofit industry. Her experience, commitment to excellence and passion for Ädelbrook’s mission will support Ädelbrook’s future success. The Ädelbrook board selected Goduti after an extensive national search led by board members, executive staff and the search firm JobFitMatters. Goduti follows Ädelbrook’s previous long-term President and CEO, Garrell S. Mullaney, who has been working with the board over the last two years on his succession plan so that he may pursue other professional endeavors. Under Mullaney’s dedicated leadership the organization has undergone a rebranding, grown from a staff of 150 to over 600, enhanced its annual budget to over $40 million and become a leader in working with children and young adults with autism and other neurodevelopmental disorders. Ädelbrook anticipates that Goduti will be able to leverage these accomplishments and help continue to expand and enhance the agency’s reach and reputation. “Ed Poff and the JobFitMatters team were a great partner to the Ädelbrook search committee. The System for Identifying Motivated Abilities (SIMA) provided a comprehensive profile for each of the final candidates equipping the committee members well for the interview process and the ultimate selection of the finalist,” said Roger Oxendale, President of Covenant Ministries of Benevolence.